My heart aches a bit today. 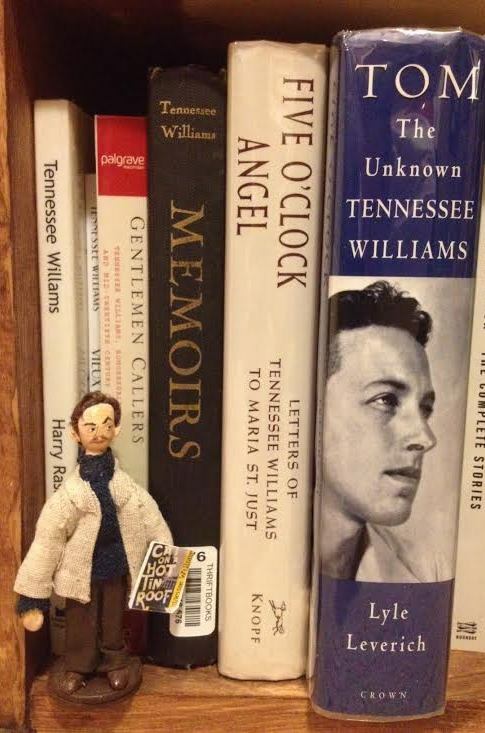 As I said on Sunday’s post, today is the anniversary of Tennessee Williams’ death. In 1983 on this day, he was found dead in his New York hotel room. Alcohol and a drug overdose were primarily to blame, but he also choked on the cap to his eye drops. He frequently held the cap in his mouth when he tilted his head back to apply the droplets. Born in Mississippi, he lived in St. Louis and attended school here for quite some time. Many of his plays are set here, including The Glass Menagerie. He, his mother, and his sister are all buried here in Calvary Cemetery though Tennessee had wanted to be buried at sea close to his own muse, Hart Crane. Williams has been a muse of mine for a long time, and I’m happy to reveal today that he is a character in my next book! Later this year, the sequel to my book Stealing Wishes will be released as an Ebook through Exciting Press. It’s called Feeling Himself Forgotten, and Tennessee makes an appearance in the book as a ghost! Look for it later this summer! Details to follow. The picture above is my small collection of TW on the bookshelf, along with the man himself. For now, rest in peace my five o’clock angel. I am thinking of you today.